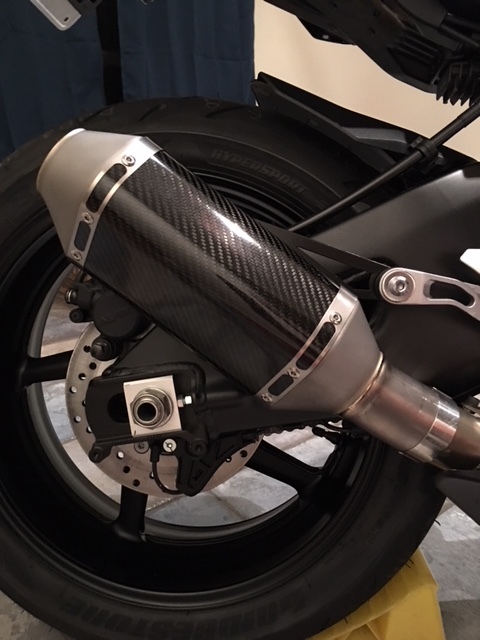 Akrapovic on mt10. like mt07? 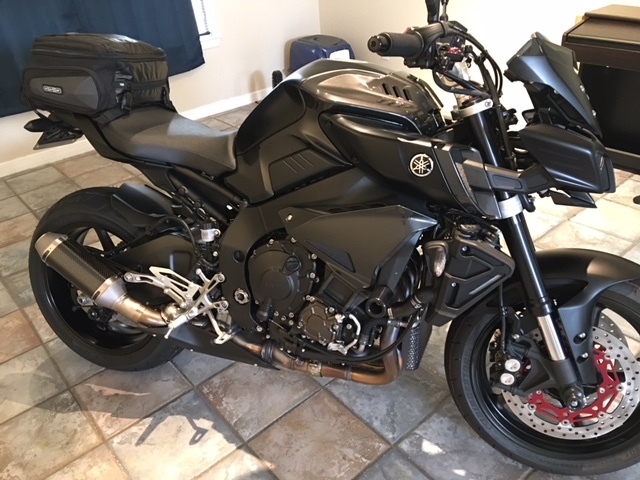 So just traded my MT07 to a MT10 SP.. before i had the full Akrapovic system on with the DB killer installed.. And to be honest i dont want it to be louder then that.. Right now its with stock exhaust so not making any sound at all.. Should i start with the y Pipe or go full system? 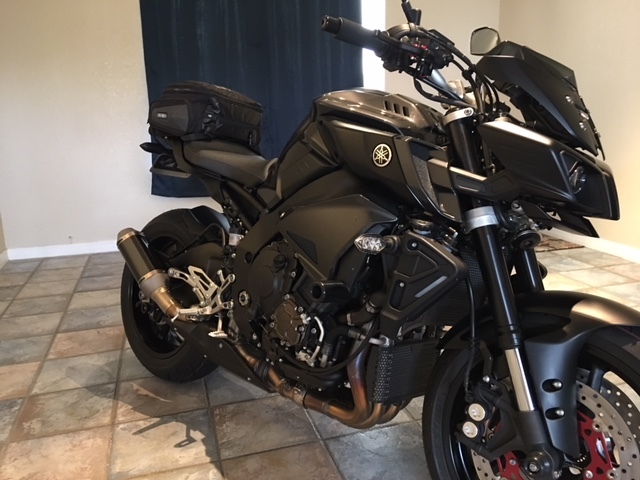 Will it be louder then my MT07? If you go with nothing but a y-pipe i'm thinking it will be substantially louder than your stock system. the OEM can has almost no baffling -- it all occurs in the cat. full system is not really necessary. If I were you I'd get a 3/4 system with a baffle if you want to keep it reasonably quiet. If you got an SP, you probably have funds to spare, but a popular alternative to getting a full system is getting a 3/4 system with an R1 header. The Graves ti header I was considering weighs 3.6 pounds, and the R1 header I purchased weighs 4 pounds. I think any difference in flow will be marginal. an alternative is the Graves EVR, which is quiet when the revs are low and loud when the revs are high due to its retention of the exup system. Welcome to the forum! I can't speak on much regarding this exhaust but I never recommend going to a full system without a dynotune. 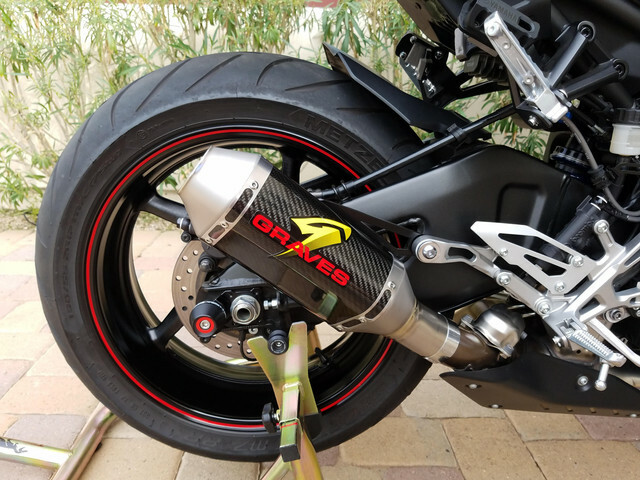 The stock headers on the FZ-10 are very good compared to most stock bikes and some people even upgrade to the R1M titanium headers which are even better. 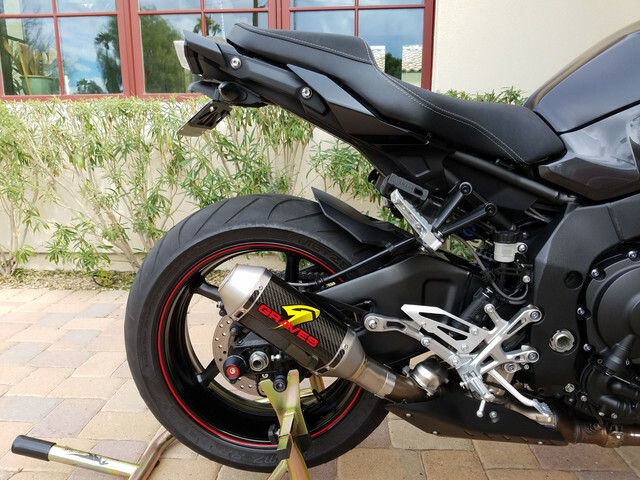 A full system without a dynotune will not produce the max horsepower and torque you're usually seeking with spending so much money on a full system. A lot of guys go with midpipes or 3/4 systems here and just get ECU flashes. Hey guys, just wanted to relay my experience. I didn't like the stock can on this bike, and neither the Akra alternative, especially for what they ask for it. At any rate, found the perfect solution for my needs (factory looking and good fit) on the Graves slip-on (pic below), with the decal removed. What I wasn't expecting is better and louder sound, but that's what I got too. 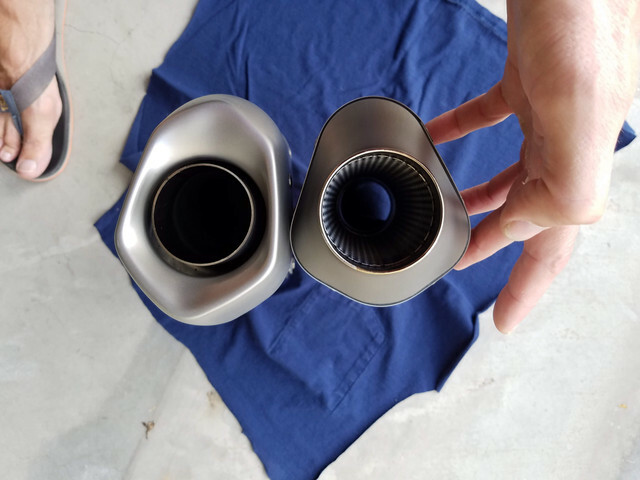 MUCH better than stock, even though both cans are straight-thru. Pleasant surprise. Very deep and exotic sound; it's incredible. I wouldn't want it any louder than it is now, since it's loud enough, but not obnoxious. 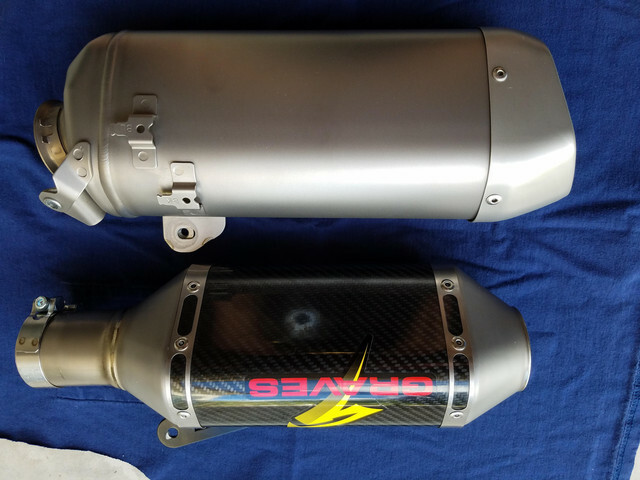 You also don't find this kind of finish (Ti and C/F) on any other can, especially for $435 delivered (Revzilla). It has a very sturdy bracket (rather than a cheap band), and a very nice clamp/flange (rather than springs), for a factory fit and look. It mounts rock solid. It didn't even need neither the band nor the bolt when the bracket holes aligned, but obviously installed both anyway. 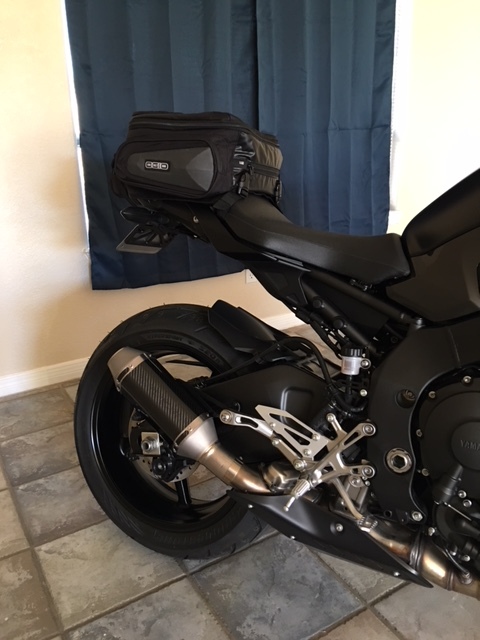 Found a nice alternative without having to remove the cat, so no having to wash my gear after every ride due to awful fuel smell. Hope this helps. No affiliation, by the way. Just a happy customer. What he said. I also removed the decal. It just looks cleaner. Did anyone try to install a link pipe on the stock exhaust?.. what i have read the cat need to be removed no matter what do get sound..
Another problem i have is where i live.. i can't dine any tunes here in denmark for motorcycles.. i read that you need e remap after changing the exhaust? 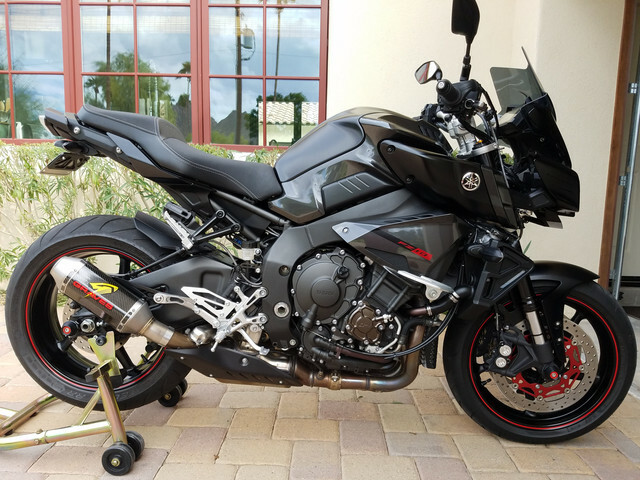 When I switched the can on my R6 it improved the exhaust note, but there was no discernible increase in volume. The R6 is like the MT10 in that baffling occurs in the cat. If you want to get the volume up, you will need to delete the cat. There are a number of people here who have just installed a link pipe, but the stock can is a straight-through can without baffling, so it will be very loud. If you want a good volume increase without going too loud, you should install a link pipe and put a baffle in the can (easiest to do with an aftermarket option). You will 100% need to flash your ECU and remap after you install a link pipe. If you do not, your ECU will try to fuel based on stock parameters and your bike will run lean. You'll also get popping on deceleration, so you need to disable the AIS which is also accomplished via flash. Some companies provide updated fuel maps if you buy their exhaust, but you need to buy an ECU flash kit to use them. You can also mail your ECU to a shop that does tunes to have them flash it for you -- this is a popular option on this forum. I'm sure there are options for that in the EU if not denmark.